It’s official. I’ve spent 100 hours playing Final Fantasy XIV, and I don’t regret a second of it. For a long time, I avoided MMORPGs like the plague. Why pay a monthly subscription fee when you can just experience a good, lengthy RPG story for a one-time payment? Out of the twelve numbered Final Fantasy games (that aren’t MMOs) that have released so far, at least ten of those have told really great and memorable stories. There was, I erroneously thought, no need for a Final Fantasy MMO when there’s already a plethora of wonderful FF games available to be experienced at a much cheaper cost. 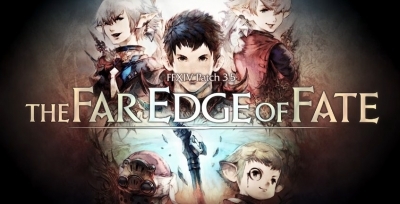 And yet, since the relaunch of FFXIV and its rebranding as A Realm Reborn back in 2013, since the endless raving about the game from its passionate community, I’ve always been tempted to jump in and see just what all the fuss is about. Just a month ago, I finally took the plunge, and set on my journey with an archer class. I leveled her up to 50, took on the classy bard job, and found myself swept up in one of the best Final Fantasy stories I’ve played through in the past decade. Mind you, Final Fantasy XIV’s vanilla story doesn’t exactly break new ground. There are a couple of shocking twists and revelations, but nothing that will completely blow your mind and question the very fabric of humanity. What it actually is, however, is a game with genuine heart and humor, and it’s full of subtle yet satisfying throwbacks to past entries in the series. There are funny scenes, and there are more somber moments that will tug at your heartstrings. Most importantly, there are characters in this game that you actually care about and want to protect. By the time I hit level 50, my bard had grown so attached to her secret group of world-saving individuals, it was hard not to feel a satisfying sense of camaraderie when everyone banded together to defeat the big bad with the power of crystals and light. Yes, the story is very much about crystals and Warriors of Light. The soundtrack is also very incredible. The thought of jumping into a fantastical and impossibly huge MMO like World of Warcraft makes me dizzy. Where would I even begin in such a huge world? But Final Fantasy XIV called out with open arms, and gave me a gentle welcome into the incredibly massive world of MMOs. Here, you need only create one character and you’d be able to check out all the classes in the game and switch between them as you please. Instead of riding dragons like in WoW, you get to ride chocobo mounts and prance around in awesome Magitek armor. Oh, and did I mention that the game starts playing a remix of Terra’s theme from Final Fantasy VI whenever you hop into said Magitek armor? As soon as I took my first, nervous steps in the leafy town of Gridania, I knew I was hooked. The music was incredible, there were NPCs with names like Biggs and Wedge, and quests with not-so-subtle names like “Eyes On Me.” There are Moogles in this world, kupo-ing at you every chance they get. And damn, I love Moogles. 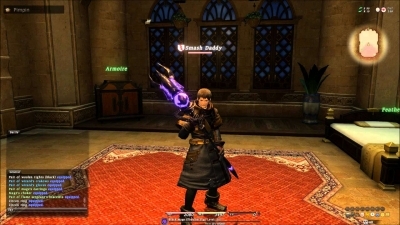 Perhaps it was the charming Final Fantasy skin that drew me in from the start. Because it’s an MMO, there will be points in the story where you will have to interact with other players. But by and large, FFXIV can be mostly experienced solo. 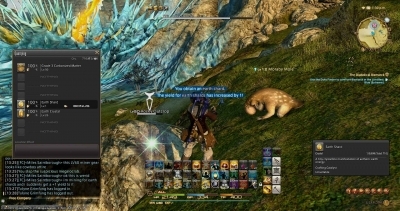 Key dungeons and trials in the game will require you to group up with others, but the in-game Duty Finder will automatically match you up with players. So you’ll go in, complete the challenge, and you can continue on your adventure again. Even with the knowledge that you’re not the only adventurer in Eorzea, FFXIV is great at making you feel important. 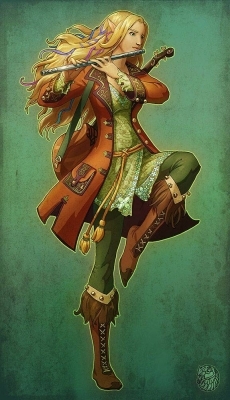 This is my bard. Her name is Alethea Windstrom. The leaders of Ul’Dah, Gridania, and Limsa Lominsa depend on her greatly. To them, she’s the Warrior of Light, and the only one capable of driving the evil Garlean Empire out of Eorzea. These are my (I mean Alethea’s. Sometimes I get confused) friends in the super secret society of adventurers who share the same drive and passion for goodness as Alethea does. They, too, see her as a vital part of the group, and they know they can always count on her to come through and save the day. By the end of A Realm Reborn, as the credits rolled, I (and by extension, Alethea) was filled with a very curious sense of satisfaction that I hadn’t felt in a Final Fantasy game in a very long time. The final dungeon and boss felt appropriately epic, and the music was suitably grand. The vanilla story was wrapped up with a lengthy, heartwarming cutscene. It felt right. Now, I’m raring to go, and I’m ready to see more of what this brave new world has to offer. 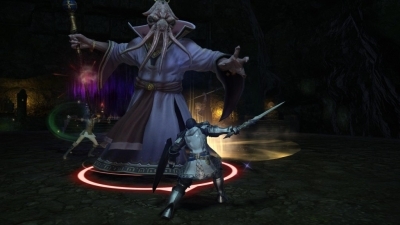 I hear it’s a bit of a grind trying to get through all the post-2.0 patch content quests before I can check out the Heavensward expansion stuff. I hear the story and writing gets even better, and that the new expansion is definitely worth the trudge. I also hear there’s still a lot of optional content I haven’t even gotten to check out yet. The Gold Saucer? In-game Triple Triad? I never thought an MMORPG would end up being one of my favorite Final Fantasy games of all time. And yet, here we are. 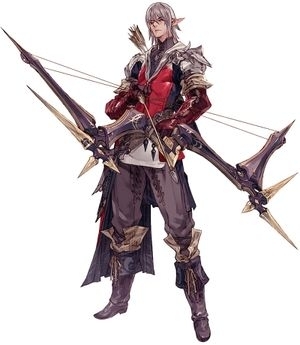 FFXIV Dragoon gets Second Wind, Keen Flurry, mega HP, high DEF and normal MDEF, and even takes less during B4B than others. Can CC Foresight if needed/desired.